Ümit Ünal is a Turkish designer born and based in Istanbul. His work is influenced by contemporary art, music, and design. From growing up in his family’s atelier to graduating from the Department of Archaeology and Art History at Istanbul University in 1989, and later from the Textile Department at the Faculty of Fine Arts of Marmara University in 1993, he has explored many paths. Since then, he has established a successful brand, working with a small team of artists and craftsmen. With an emphasis on techniques done by hand, such as embroidery, hand stitching and overdyeing, there is an additional layer of rich sophistication added to his fluid and often monochromatic collections. Ümit Ünal’s FW 2018 collection brought placket button-ups in shades of grey, blue and neutral tones. Coats in similar colors were crafted to be layered over other pieces, along with lightweight sweaters. Some standout garments include the metallic coat in grey, and short knitted top in a vibrant navy, though Ümit’s collared shirts are always an intellectual yet edgy delight. For SS 2019, despite the fact Ümit is still producing items in classic silhouettes, there is nothing boring about these garments. While they retain an air of simplicity, they are also detailed with personality. 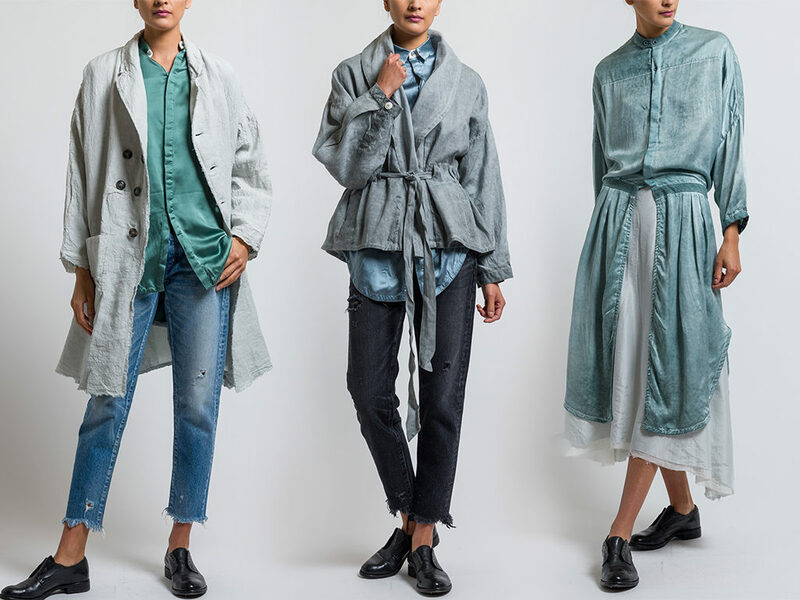 Coats are stitched out of washed fabric with mindful texture, while cuffs and hemlines are trimmed with frayed edges, adding an artful and rebellious air. 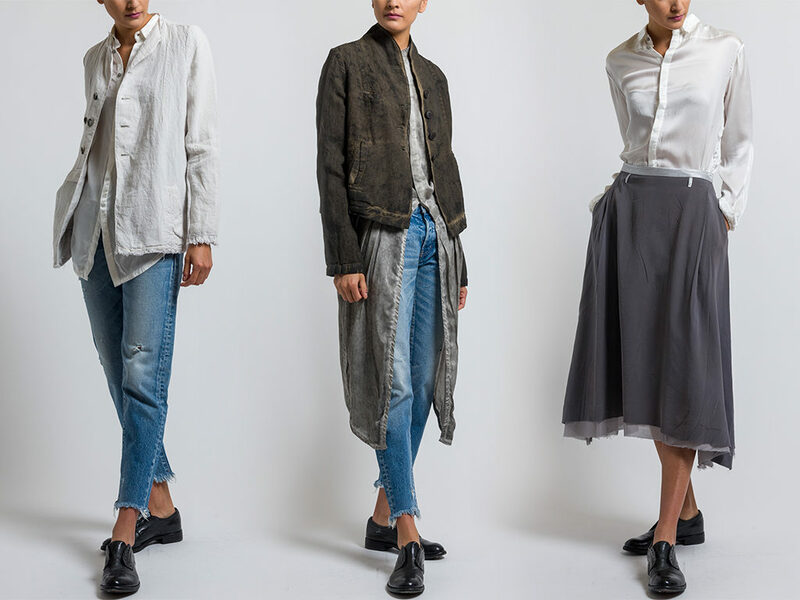 Simultaneously, button-ups are created with luxe fabrics, and detailed with hand-stitched embroidery, while the underside of point collars are sewn with white fabric. Ümit has added light blues and vibrant teal tones to his trademark “non-color” palette, of which the teal may be one of the brightest colors we have seen in Ümit’s collections to date. All of these details culminate in a darkly romantic, yet casual essence, that ultimately creates a certain universality in each of his pieces. His designs are fluid in every way, from the fabric in use to their thoughtful narrative that often deals with the concepts of androgyny. Part of what makes Ümit Ünal such a strong designer is the effortless duality he instills in each of his pieces. A button up is sophisticated enough to be worn in such a setting but remains casual enough to be worn daily. 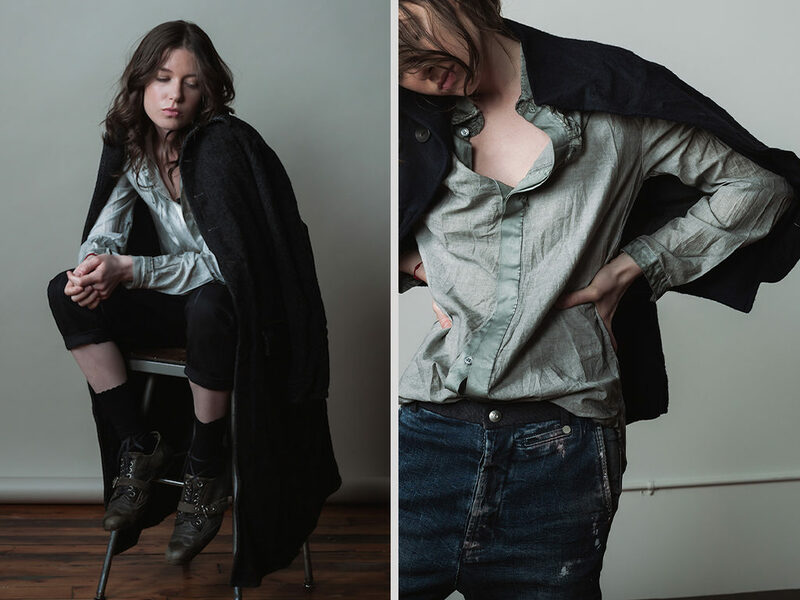 Coats are cut with simple lines which help elevate an outfit, while the textural fabrics, additional buttons, and slightly off-kilter pockets are casual, detailed quirks. Context is everything, which is why Ümit’s work is so versatile as it all depends on how you style it.